In the title story, an unnamed smalltimer sets out on a business trip down the winding Gallatin Canyon, Mont., road with his girlfriend, Louise. He conducts his business dealings with phony bluster and indecision, humiliating himself in the eyes of this woman he hopes to marry; things get worse from there. The selection and treatment of this photo is pretty much perfect. Publishers Weekly talks about "the prevailing dreariness," and if that sky doesn't say "dreary," I don't know what does. And how brilliant that the photo is NOT of the canyon. Rather, we're forced to wonder about the canyon beyond the barrier, and what happens there. Lastly, the barrier itself is wonderful: scarred by repeated crashes and scrapes, it tells us that you don't want to be on this road or in the canyon that's below. Damn, Knopf puts out some great work. I recognized this image from a photographer at www.photoseen.com. His name is Thibaut Petillon. It looks like the bumped up the saturation. I think the original subtle colors work much better. See it here. 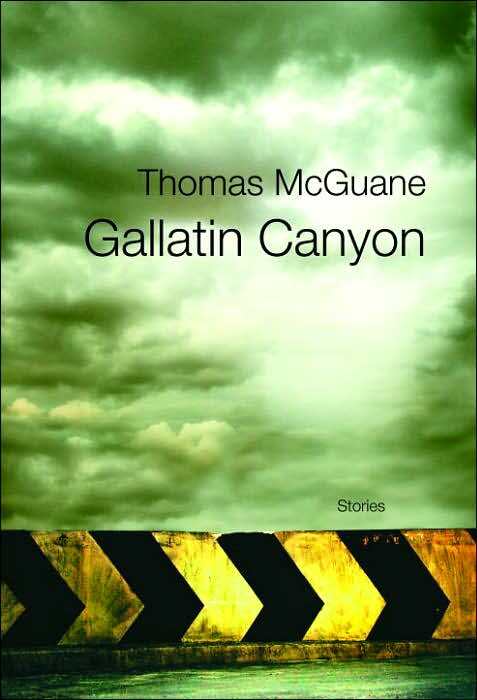 I'm Thibaut Petillon, I made this image for the Thomas McGuane book cover. As Charles noticed (hi Charles ! ), the saturation has been forced. Original image is much more desaturate. Randomhouse told me it was because of the compression.